What is still not known nearly as well as it should be is the simple fact that the very rubrics of the Ordinary Form of the Roman Rite demonstrate the normativity of the traditional orientation of prayer at Mass. Every edition of the Novus Ordo Missae, from the earliest down to the latest revised translation, contains rubrics that clearly presuppose that the priest is facing the altar or “liturgical east” and that he will need to turn around to address the people at various points. For some readers this will be familiar territory, but for others, it may be one of those obvious points that has nevertheless managed to escape notice until now. Below, I will simply reproduce the texts that contain instructions pertinent to the priest’s position vis-à-vis the people. 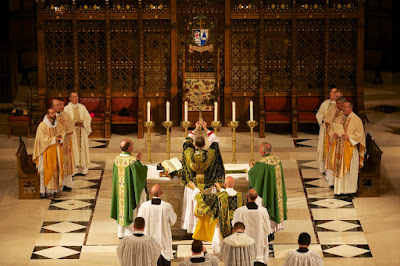 If the priest were assumed to be always or normatively facing the people throughout the offertory, there would be no need for the rubric to specify that at the “Pray, brethren” he should now be “facing the people.” This phrase is to be taken in contraposition to “standing at the altar,” i.e., in the ad orientem position. Again, if during the Eucharistic Prayer and ensuing Communion Rite the priest had already been facing the people throughout, the boldfaced rubric would be superfluous. There is no reason to specify that the peace should be given “turned towards the people” unless he has been turned away from them until this point. Summarizing the next few paragraphs: 128. If appropriate, the sign of peace. 129. Fracture. (Note that if the priest is celebrating ad orientem, he will be turning towards the Lord again at this point — which will make sense out of the upcoming n. 132, as we shall see below.) 130. Agnus Dei. 131. Prayer before communion. Here and in the following number, the rubrical presupposition of eastward celebration is particularly obvious. If we imagine that the priest is celebrating versus populum, it would be strangely inconsequential for the rubrics to say that he should be turned towards the people at the giving of peace (n. 127) and then to note again, a mere matter of moments later, that he should be “facing the people” for the “Behold the Lamb of God” (n. 132). The obvious implication is that between these two moments, he must have turned eastwards to face the Lord present upon the altar of sacrifice. Once he picks up the host and paten or host and chalice, he then needs to turn around again to address the people. This reading is confirmed by n. 133. From the Prayer over the Gifts to the giving of peace, the priest has been facing ad orientem. At the giving of peace, he turns around to address the congregation (n. 127). He turns again to the altar for the fraction, Agnus Dei, and prayer before communion. He turns to the people to say “Behold the Lamb of God…” (n. 132). He faces the altar again to consume the precious Body and Blood of Christ (n. 133). This may sound like a lot of turning back and forth, but as clergy and faithful know who have attended Ordinary Form Masses celebrated in perfect accord with these rubrics, the actions flow smoothly and, what is far more important, they make sense. When addressing primarily the people, the priest faces them; when addressing primarily God, he remains in the normative position of facing Him, symbolized by the east and, after the consecration, truly present upon the altar of sacrifice. It should not be necessary by now to point out that if there exists a need to specify that the priest ought to be facing the people for the Prayer after Communion, it is because he cleansed the vessels in his usual posture for the Liturgy of the Eucharist, viz., standing at the western side of the altar, facing eastwards. 140. If they are necessary, any brief announcements to the people follow here. The phrase “facing the people” would seem superfluous here, but the possibility of an interruption by announcements might prompt a question about the stance the priest should take up afterwards. In any case, this rubric falls into the pattern of the priest being told to face the people when saying “The Lord be with you,” with some notable exceptions: see n. 31 and all the Preface dialogues, where the priest is never told to be facing the people. The General Instruction of the Roman Missal (2011, 2nd ed.) matches the foregoing rubrics in every respect, with the same implications as above. One may consult GIRM 124, 146, 154, 157, 158, and 165; cf. 181, 185, 243, 244, 257, 268. The controversy over the egregious mistranslation of GIRM 299 is not our concern at present; see here to read more. I will limit myself to the observation that one who clings to the mistranslation of n. 299 effectively consigns over a dozen other paragraphs of the GIRM, namely those listed above, to incoherence or total superfluity. [T]he doctrine which stands out in the following sentence, already notable and concisely expressed in the ancient Sacramentary commonly called the Leonine — “for whenever the memorial of this sacrifice is celebrated the work of our redemption is accomplished” — is aptly and exactly expounded in the Eucharistic Prayers; for as in these the Priest enacts the anamnesis, while turned towards God likewise in the name of all the people, he renders thanks and offers the living and holy sacrifice, that is, the Church’s oblation and the sacrificial Victim by whose death God himself willed to reconcile us to himself; and the Priest also prays that the Body and Blood of Christ may be a sacrifice which is acceptable to the Father and which brings salvation to the whole world. Part of the new liturgical movement is surely rediscovering how just and right it is when the priest is "turned towards God in the name of all the people" -- and when the people, facing east together with him, offer up the sacrifice of praise.